The word clematis comes from ancient Greece and translated means ‘climbing plant’ – a pretty obvious choice to say the least. There are now over 250 known species and cultivars of this most astounding vine. Such a large variety enable the gardener to have masses of blooms from late winter to late fall, by simply planting varieties with different bloom times. Two of my all time favorites are ‘Jackmanii’ with extra large purple blooms and ‘Nellie Moser’ with a star of lavender on white! Both are vigorous and easy to grow and can be completely pruned to the ground in late fall – making clean up a snap. At our nursery we have dozens of truly unique cultivars to select from, most are scented, although no clematis is strongly perfumed. 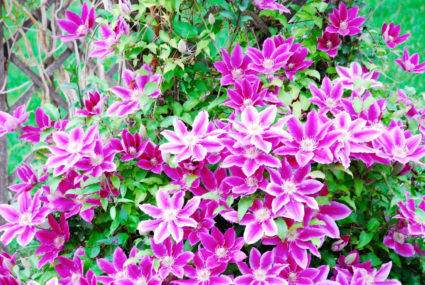 Clematis fall into 5 rather specific pruning types, and you will need to look at the lable to find the correct method for your selection. They love full sun, but you should plant the roots in deep, rich, moist soil – shading the roots will really make them happy. A light trellis is all they need to grow on and display their incredibly beautiful blooms.